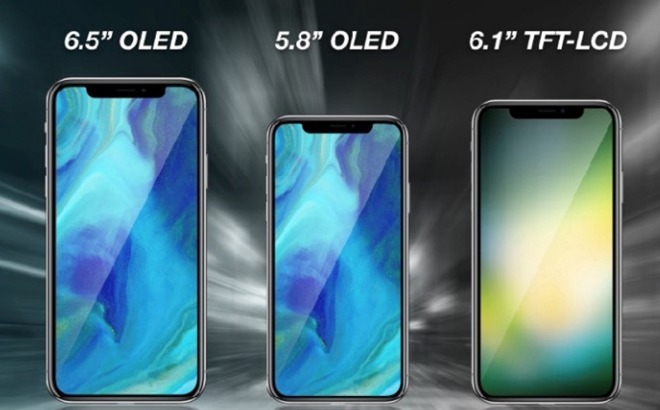 Apple could choose to make this year's 5.8-inch iPhone X successor $100 cheaper at $899, reserving the old pricetag for a new 6.5-inch device, according to one analyst. The company has had "limited success" trying to pitch the iPhone X at $999, RBC Capital Markets analyst Amit Daryanani argued in an investor memo obtained by AppleInsider. Making its follow-up cheaper would lower Apple's average selling price but might compensate by increasing units sold, he said. The memo agrees with rumors pointing to Apple shipping three new iPhones this year. The first two —the 5.8- and 6.5-inch models —should use OLED displays, but the third is expected to adopt a 6.1-inch LCD format. Daryanani suggested that the LCD model will use aluminum edges, while the OLED ones will be equipped with "premium steel." Critically, all three phones are likely to use Face ID —something currently reserved for the X, and enabling smaller bezels by ditching the need for a home button, where Touch ID devices have their fingerprint sensor. It isn't clear where Daryanani sourced the data about pricing, or if the estimates are an educated guess based on the history of Apple's prior pricing moves. Prior to the iPhone X release, analysts suspected that the iPhone X could start at $1200. For years Apple's flagship iPhones started at $649, with marketing claiming $199 price points with carrier subsidies. While the iPhone X can be seen as a special case, even the iPhone 8 —which has a 4.7-inch LCD, and lacks Face ID —is priced at $699. Apple is likely to announce its 2018 iPhone lineup in September, as usual. The company may start trial production as soon as next quarter, looking to avoid a repeat of the delays that forced the X to ship in November 2017. Reports have blamed that on the 3D-sensing TrueDepth camera, which is said to be difficult to make. RBC is maintaining an "outperform" rating for Apple stock, including a $205 target.